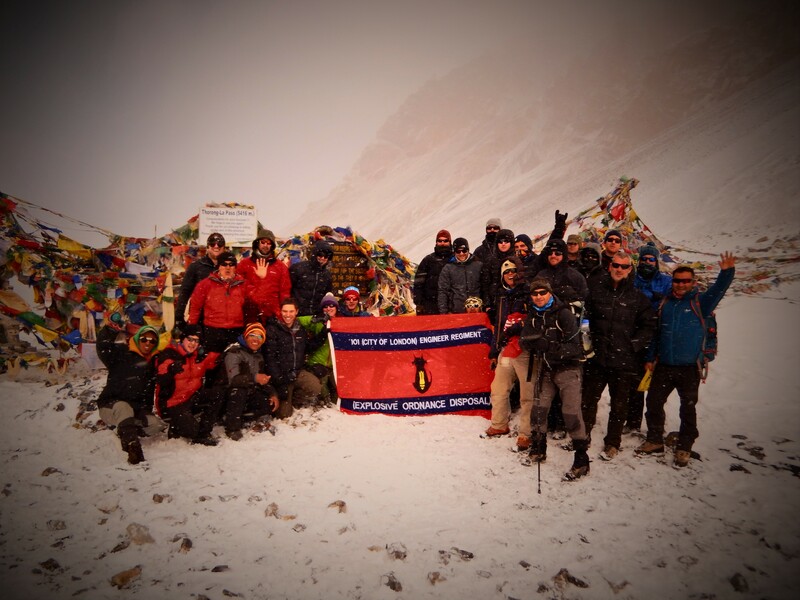 Ex Calo Biralo 2016, which saw 19 Members of 101 (City of London) Engineer Regiment (EOD) and their instructors travel to the Himalayas of central Nepal and trek the much revered Annapurna Circuit. Its aim; to test the group both physically and mentally in an arduous environment culminating in the Tharong La pass (5416m), whilst continuing to strengthen the bond between the regular and reserve units represented. For most, the destination and the high mountain environment were new. Forecast temperatures were surely wrong; more akin to the beaches of the Costa del Sol than a Himalayan winter. How would altitude affect us when exposed to reduced oxygen levels for longer than the time it takes to descend from the top of a ski resort? And how would our trip be affected by a fuel blockade, in an area recently hit by extensive earthquakes? A heavy landing in Kathmandu marked the beginning of our long journey up into the mountains. Bags repacked, 4x4s loaded and with our Nepalese guides now running the show we left the smog of the city behind us and headed north. Any hopes of a comfortable journey were soon forgotten. A whole day was spent bumping our way along ever less considerable roads in cramped vehicles until, after hours on rough single-track following the course of a river and in darkness, we arrived at our destination – Chyamche, 1385m. After a brief introduction to Tea house living and eating, we turned in. The next 8 days, slipped into routine. Breakfast at 0700, packed and moving by 0800, regular stops to regroup and rehydrate, lunch by 1200 and get to our new accommodation by 1600. Then an evening of de-briefs, re-briefs and dinner to set us up for the following day. Distances and height gains were kept small to allow the body to adapt to the thinner air. The one thing not routine, however, was the scenery. At first our path was confined by a steep sided valley with massive granite and limestone walls, mountains rising sharply to 4000m+ and punctuated by small villages and sweeping footbridges; already on a different scale to anything found in the UK. Day by day 4000m peaks became snow caped 7000ers as we climbed steadily through bands of tropical forests, pines woods, grassland and finally the near-desert above 3000m. 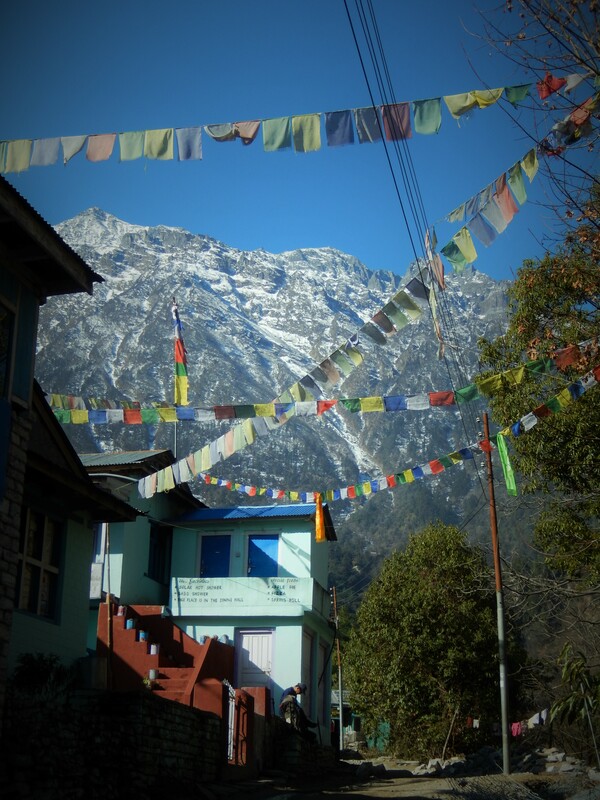 Day 4 brought us to the provincial and cultural capital (still only a village) of Manang – 3540m – where we would stay for a full day, acclimatising in the shadow of the massive peaks of the Annapurna Himal. A virus had established itself in the group early on and despite best efforts it seemed to be spreading, exacerbated by the thin air. Who exactly suffered fluctuated almost daily and the higher we were the greater the impact was. Credit is due to the group members who completed the circuit despite feeling this extra strain. After 7 days, approximately 70km of trekking, and 3100m height gain we were left with the Tharong La pass – 5416m – standing between us and the Mustang valley, the end point of our circuit. An epic, 12 hour final day saw us top out in light snow with sore heads and shallow breathing but still able to smile for a photo before a speedy descent into a the relative syrup of oxygen down in Muktinath – 3800m. All in all the entire trek proved to be an awe-inspiring, all-consuming experience for both novice and experienced mountaineers alike and tested everyone at various stages. Our guides and porters, organised through ‘Gurkha Adventures’ were fantastic and worked tirelessly every day to provide us with essentials as well as information about the history and culture of the area. For our head guide this was no less than his 50th time working the route. The remainder of the expedition comprised of a short white water rafting trip in the icy waters of the Kali Gandakhi and a couple of days R&R in the city of Pokhara before the long journey back south to Kathmandu. This expedition was a truly once in a life time opportunity, well prepared and run, and a great experience for all who attended. For myself, as junior reserve officer, this was also a great chance to work with and speak to soldiers and officers of all ranks and to observe the process of organising and managing a very successful expedition. Massive thanks are due to the Ulysses Trust for offering a grant without which the expedition may never have gone ahead.